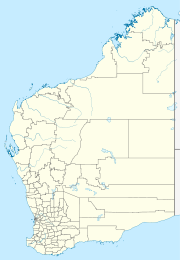 Cosmo Newbery (also spelt Cosmo Newberry, also known as Yilka) is a small Aboriginal community in Western Australia located 1,036 kilometres (644 mi) east of Perth between Laverton and Warburton in the Goldfields-Esperance region of Western Australia. In the 2011 census, Cosmo Newbery had a total population of 74, including 64 Aboriginal and Torres Strait Islander people. The town is named after James Cosmo Newbery who was an industrial chemist noted for his work on improving the chlorination method of gold extraction. The area was originally leased by two returned soldiers as a cattle station, then as a penal colony for a short time, then later became a government ration depot. The town was first settled in 1920. By 1953 the Uniting Church set up a mission but eventually, in 1976, gave the land back to the Aboriginal people living in the area at that time. The town operated for 11 years and was then abandoned for 4 years. In 1989 four families moved back into the town who were quickly followed by others. The town now has a health clinic, school, a hall, windmills, communication centre, fuel station and shop. The town is one of the stops along the Great Central Road that tracks through the Great Victoria Desert and eventually connects with the Gunbarrel Highway, there is a roadhouse operating in the town. The community is located within the Registered area of the Yilka (WAD297/2008) Native Title claim. The community is managed through its incorporated body, Cosmo Newberry Aboriginal Corporation, incorporated under the Aboriginal Councils and Associations Act 1976 on 31 January 1991. Cosmo Newberry Layout Plan No.1 has been prepared in accordance with State Planning Policy 3.2 Aboriginal Settlements. Layout Plan No. 1 was endorsed by the community on 19 May 2000 and by the Western Australian Planning Commission (WAPC) on 21 August 2001. The Layout Plan map-set and background report can be viewed at Planning Western Australia's official site[permanent dead link]. ^ Australian Bureau of Statistics (31 October 2012). "Cosmo Newbery (State Suburb)". 2011 Census QuickStats. Retrieved 5 March 2017. ^ "About Cosmo Newberry". 2012. Retrieved 1 January 2013. ^ "Australian Dictionary of BiographyCosmo Newberry". 2010. Retrieved 30 January 2011. ^ "ExplorOz Cosmo Newberry". 2010. Retrieved 30 January 2011. ^ "NRMA Great Central Road". 2010. Retrieved 30 January 2011. This page was last edited on 25 April 2018, at 05:48 (UTC).